Walkin' After Midnight You remember it, don't you? The AT&T WorldNet commercial? 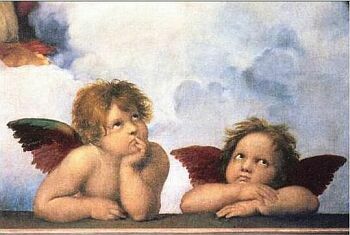 The boy and girl (played by Larisa Oleynik) end their date, then talk to each other on the internet, while Patsy Cline's song "Walkin' After Midnight" plays, and the boy sends the girl this picture of angels with the girl's head replacing the left angel's? I loved that commercial. Seriously. I think it might've been a remake of the song, but I'm not sure. If so, I wish I had a copy of that version. But hey, at least I have a Patsy Cline CD with the original. Not bad at all.